The tight end position has been pretty difficult to draft in the last few years. It seems as though if you didn't spend the draft capital to grab one of the top three, (Gronkowski, Kelce, Reed at the time) you had to settle for a frustrating year at the tight end position. Thanks to this, many fantasy football owners have settled on grabbing their tight end late in the draft, hoping to find a gem. Gems like Zach Ertz was last season. Some even do this with the mindset that they will stream tight ends based on hot hand or matchup all season long. The tight end position continues to be foggy, but here are three guys that might be worth that late round shot. We will start out with my favorite tight end sleeper of 2018: Trey Burton. Burton didn't have some extraordinary season in 2017 with the Eagles, but that's mostly due to the fact that he was stuck behind Zach Ertz. When Ertz missed time due to injury however, Burton showed he has the athleticism to be a solid tight end in the NFL. Burton's first chance against a tough Denver defense was decent, catching two of four targets for 41 yards and a touchdown. His second chance against the Rams was much better. He caught five of six targets for 71 yards and two touchdowns. He finished 2017 with 23 catches for 248 yards and five touchdowns. Burton was picked up by the Bears in the offseason, and coach Nagy has said they want to use Burton in a Travis Kelce-like role. I think we all know how well Kelce performs. Burton is currently being drafted in the beginning of the eighth round in 12-team PPR mock drafts. He is the 9th TE off the board. That means you have a nice opportunity to grab him a whole round later than when Zach Ertz went last year, and hopefully you will be rewarded. Jack Doyle is currently being drafted in the beginning of the 11th round (11.03), or the 12th TE off the board. That seems criminally undervalued for a player who had a solid season in 2017, even without QB Andrew Luck. Doyle finished the season with 80 catches on 108 targets for 690 yards and four touchdowns. And that was with scrambling QB Jacoby Brisset. Overall Doyle finished as the seventh tight end in PPR scoring. The year prior, with Luck, Doyle was targeted 75 times, catching 59 passes for 584 yards and five touchdowns. 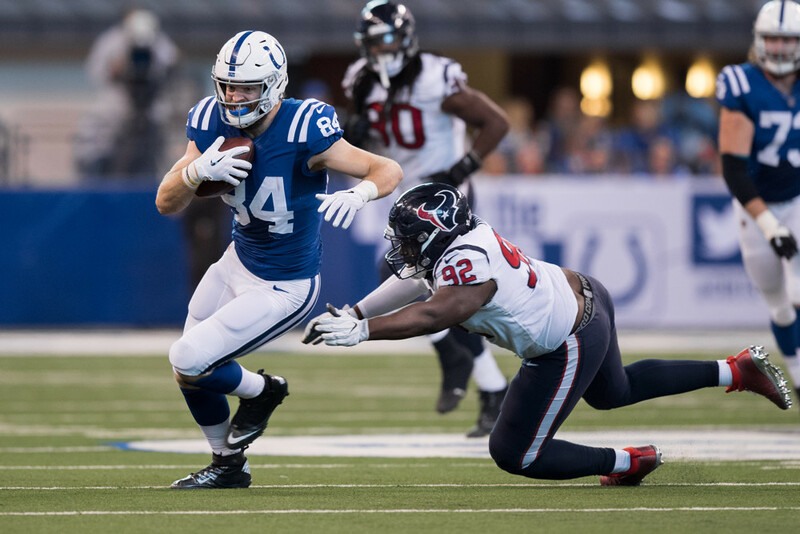 So far it seems that Luck is finally back on track to play this season, so Doyle should see at least similar numbers to his 2016 campaign. We can also speculate that Luck will be looking to throw quicker, shorter passes until his confidence fully returns, which is good for Doyle. Choosing Doyle in the eleventh, or even later rounds seems to be a steal for a solid tight end. A year or two ago you'd never have seen Tyler Eifert on this list. He always was one of the top drafted tight ends. Unfortunately for him, injuries have derailed his career. Eifert played in two games in 2017, and only eight games in 2016. We have to look back to 2015 to truly remember what Eifert can be. That season he caught 52 of 74 targets for 615 yards and a whopping 13 touchdowns. After another disappointing injury last year, Eifert finally debuted in minicamp this last week. Hopefully Eifert can stay healthy this 2018, as the Bengals really need their tight end. Eifert is currently being drafted early in the thirteenth round (13.03). He is the 14th TE off the board. Eifert has shown us that he can be a top-5 tight end, but there obviously is serious risk in drafting him. The nice thing is that you can draft him very late as a deep sleeper. He is another good option as a fantasy experiment. If he gets injured or doesn't work out, you can stream without having spent too much draft capital. If he hits.sky's the limit.